In Excel, there are two kinds of tick marks (✓) that you can insert – a check mark and a checkbox. And no… these are not the same. 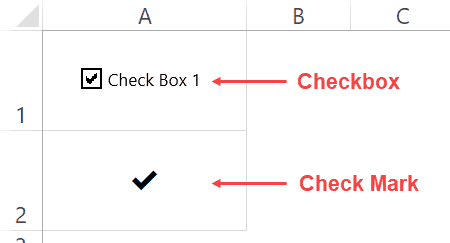 While a check mark and a checkbox may look somewhat similar, these two are very different in the way it can be inserted and used in Excel. A check mark is a symbol that you can insert in a cell (just like any text that you type). This means that when you copy the cell, you also copy the check mark and when you delete the cell, you also delete the check mark. Just like regular text, you can format it by changing the color and font size. A checkbox, on the other hand, is an object that sits above the worksheet. So when you place a checkbox above a cell, it’s not a part of the cell but is an object that is over it. This means that if you delete the cell, the checkbox may not get deleted. Also, you can select a checkbox and drag it anywhere in the worksheet (as it’s not bound to the cell). You will find checkboxes being used in interactive reports and dashboards, while a checkmark is a symbol that you may want to include as a part of the report. A check mark is a symbol in the cell and a checkbox (which is literally in a box) is an object that is placed above the cells. In this article, I will only be covering check marks. If you want to learn more about checkbox, here is a detailed tutorial. There are quite a few ways that you can use to insert a check mark symbol in Excel. In this article, I will show you all the methods I know. The method you use would be dependent on how you want to use the check mark in your work (as you’ll see later in this tutorial). Starting with the easiest one. 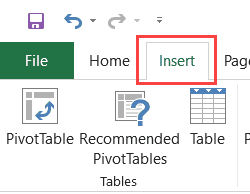 Since you’re already reading this article, you can copy the below check mark and paste it in Excel. To do this, copy the check mark and go to the cell where you want to copy it. Now either double-click on the cell or press the F2 key. This will take you to the edit mode. Simply paste the check mark (Control + V). Once you have the check mark in Excel, you can copy it and paste it as many times as you want. This method is suited when you want to copy paste the check mark in a few places. Since this involves doing it manually, it’s not meant for huge reports where you have to insert check marks for hundreds or thousands of cells based on criteria. In such a case, it’s better to use a formula (as shown later in this tutorial). 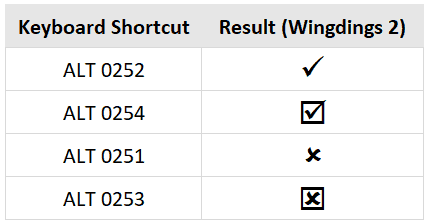 For using the keyboard shortcuts, you will have to change the font of the cells to Wingdings 2 (or Wingdings based on the keyboard shortcut you’re using). Below are the shortcuts for inserting a check mark or a cross symbol in cells. To use the below shortcuts, you need to change the font to Wingdings 2. Below are some more keyboard shortcuts that you can use to insert check mark and cross symbols. To use the below shortcuts, you need to change the font to Wingdings (without the 2). This method is best suited when you only want a check mark in the cell. Since this method requires you to change the font to Wingdings or Wingdings 2, it will not be useful if you want to have any other text or numbers in the same cell with the check mark or the cross mark. 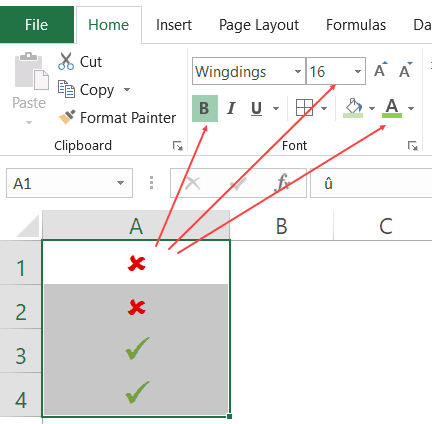 Another way to insert a check mark symbol (or any symbol for that matter) in Excel is using the Symbol dialog box. Select the cell in which you want the check mark symbol. Click the Insert tab in the ribbon. Click on the Symbol icon. 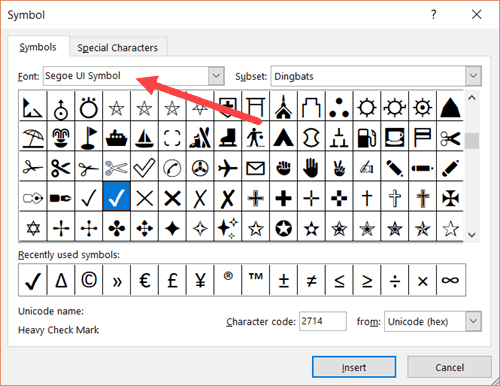 In the Symbol dialog box that opens, select ‘Segoe UI Symbol’ as the font. Scroll down till you find the check mark symbol and the double click on it (or click on Insert). The above steps would insert one check mark in the selected cell. If you want more, simply copy the already inserted one and use it. 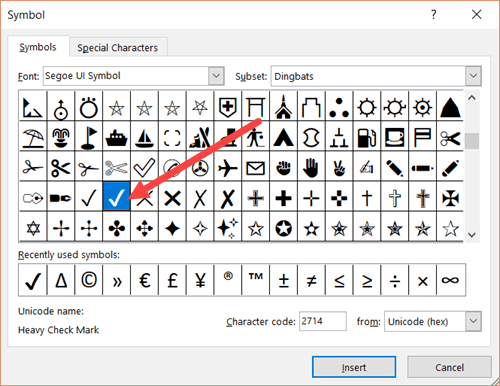 Note that using ‘Segoe UI Symbol’ allows you to use the check mark in any regularly used font in Excel (such as Arial, Time Now, Calibri, or Verdana). The shape and size may adjust a little based on the font. This also means that you can have text/number along with the check mark in the same cell. This method is a bit longer but doesn’t require you to know any shortcut or CHAR code. Once you have used it to insert the symbol, you can reuse that one by copy pasting it. You can use the CHAR function to return a check mark (or a cross mark). 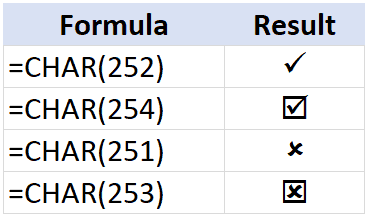 The below formula would return a check mark symbol in the cell. Because when you use the CHAR(252) formula, it would give you the ANSI character (ü), and then when you change the font to Wingdings, it is converted to a check mark. You can use similar CHAR formulas (with different code number) to get another format of the check mark or the cross mark. The real benefit of using a formula is when you use it with other formulas and return the check mark or the cross mark as the result. You can use the below IF formula to get a check mark if the sale value is more than 5000 and a cross mark if it’s less than 5000. Remember, you need to convert the column font to Wingdings. This helps you make your reports a little more visual. It also works well with printed reports. 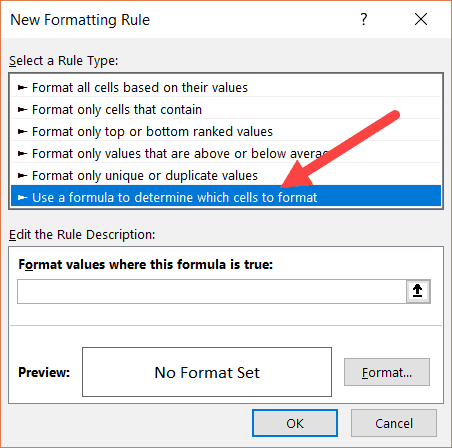 If you want to remove the formula and only keep the values, copy the cell and paste it as value (right-click and choose the Paste Special and then click on Paste and Values icon). This method is suited when you want the check mark insertion to be dependent on cell values. 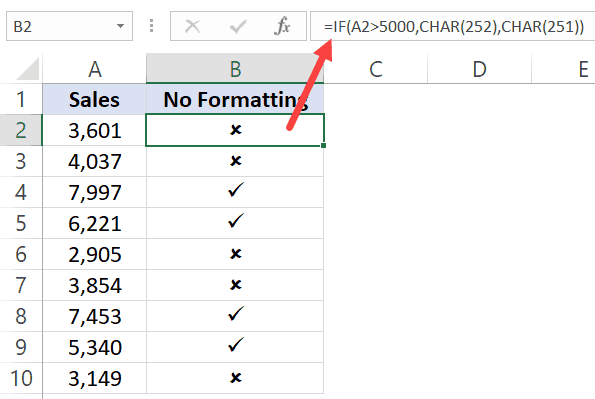 Since this uses a formula, you can use it even when you have hundreds or thousands of cells. Also, since you need to change the font of the cells to Wingdings, you can’t have anything else in the cells except the symbols. Excel has a feature where it can autocorrect misspelled words automatically. For example, type the word ‘bcak’ in a cell in Excel and see what happens. It will automatically correct it to the word ‘back’. This happens as there is already a pre-made list of expected misspelled words you’re likely to type and Excel automatically corrects it for you. 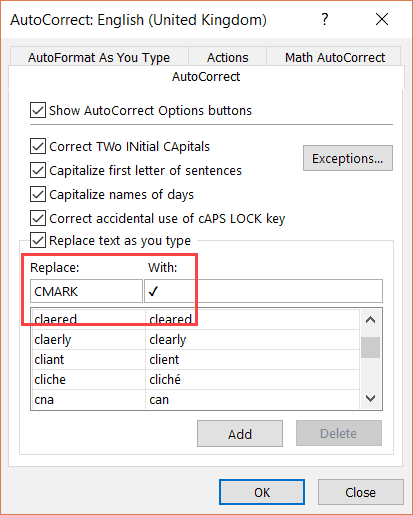 Now whenever you type the words CMARK in a cell in Excel, it will automatically change it to a check mark. This is case sensitive. So if you enter ‘cmark’, it will not get converted into the check mark symbol. You need to enter CMARK. This method is suited when you want a ready reference for the check mark and you use it regularly in your work. So instead of remembering the shortcuts or using the symbols dialog box, you can quickly use the shortcode name that you have created for check mark (or any other symbol for that matter). 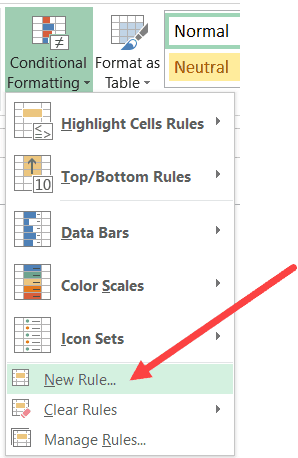 You can use conditional formatting to insert a check mark or a cross mark based on the cell value. For example, suppose you have the data set as shown below and you want to insert a check mark if the value is more than 5000 and a cross mark if it’s less than 5000. In cell B2, enter =A2, and then copy this formula for all cells. 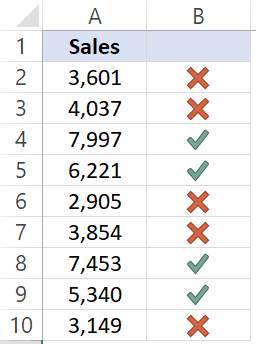 This will make sure that now you have the same value in the adjacent cell and if you change the value in column A, it’s automatically changed in column B. Select all the cells in column B (in which you want to insert the check mark). In the ‘New Formatting Rule’ dialog box, click on the ‘Format Style’ drop down and click on ‘Icon Sets’. In the ‘Icon Style’ drop-down, select the style with the check mark and cross mark. Check the ‘Show Icon only’ box. This will ensure that only the icons are visible and the numbers are hidden. In the Icon settings. change the ‘percent’ to the ‘number’ and make the settings as shown below. The above steps will insert a green check mark whenever the value is more than or equal to 5000 and a red cross mark whenever the value is less than 5000. In this case, I have only used these two icons, but you can also use the yellow exclamation mark as well if you want. 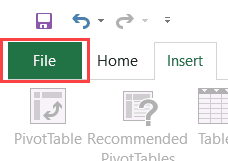 With a little bit of VBA code, you can create an awesome functionality – where it inserts a check mark as soon as you double click on a cell, and removes it if you double click again. To do this, you need to use the VBA double-click event and a simple VBA code. But before I give you the full code to enable double click, let me quickly explain what how VBA can insert a check mark. The below code would insert a check mark in cell A1 and change the font to Wingdings to make sure you see the check symbol. Now I will use the same concept to insert a check mark on double click. This is a good method when you need to manually scan a list and insert check marks. You can easily do this with a double click. The best use case of this is when you’re going through a list of tasks and have to mark it as done or not. A check mark is just like any other text or symbol that you use. This means that you can easily change its color and size. 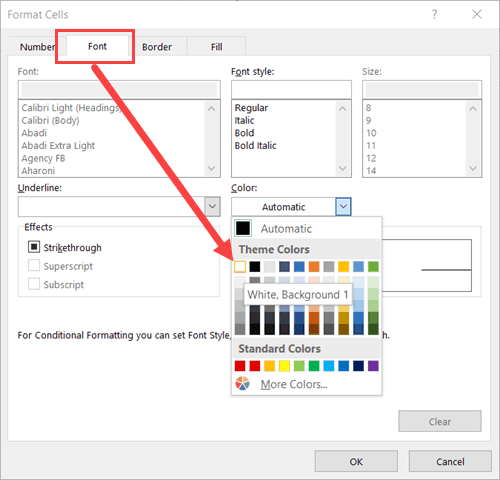 All you need to do is select the cells that have the symbol and apply the formatting such as font size, font color, and bold etc. This way of formatting symbols is manual and suited only when you have a couple of symbols to format. 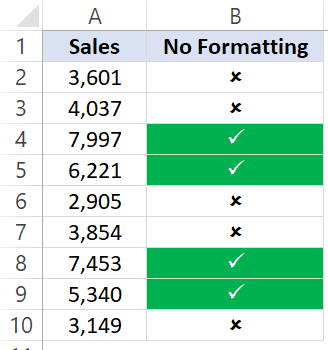 If you have a lot of these, it’s better to use conditional formatting to format these (as shown in the next section). 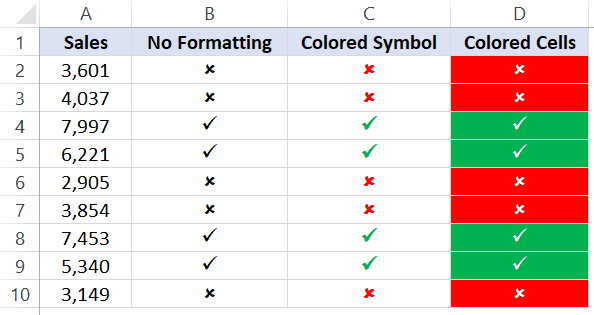 With conditional formatting, you can format the cells based on what type of symbol it has. 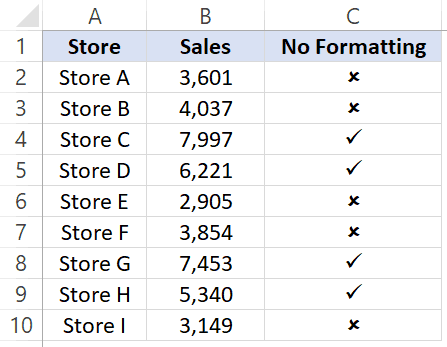 Column B uses the CHAR function to return a check mark if the value is more than 5000 and a cross mark if the value is less than 5000. The ones in column C and D uses conditional formatting and look way better as it improves visual representation using colors. Let’s see how you can do this. Below is a dataset where I have used the CHAR function to get the check mark or cross mark based on the cell value. Select the cells that have the check-mark/cross-mark symbols. 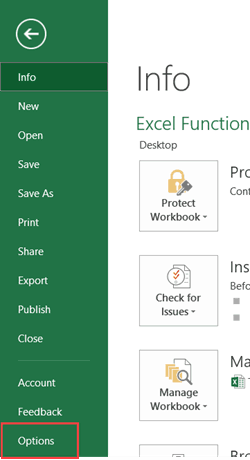 In the ‘Format Cells’ dialog box, go to the Fill tab and select the green color. 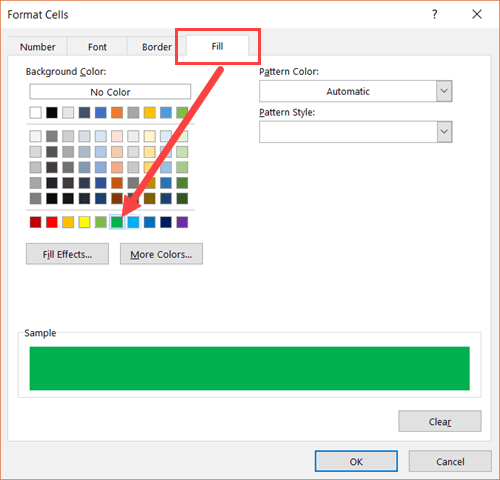 Go to the Font tab and select color as white (this is to make sure your checkmark looks nice when the cell has a green background color). After the above steps, the data is going to look as shown below. All the cells that have the check mark will be colored in green with white font. 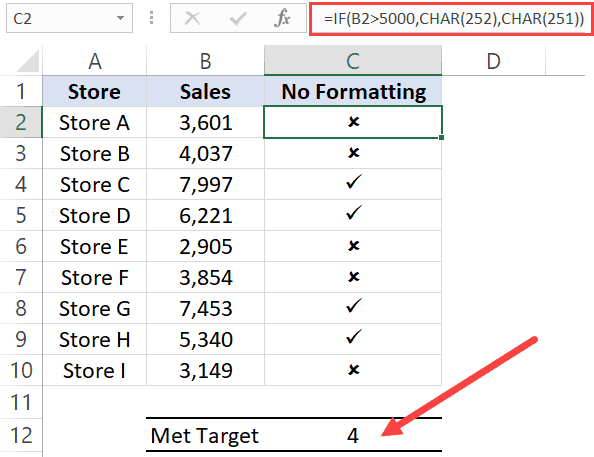 You need to repeat the same steps to now format the cells with a cross mark. 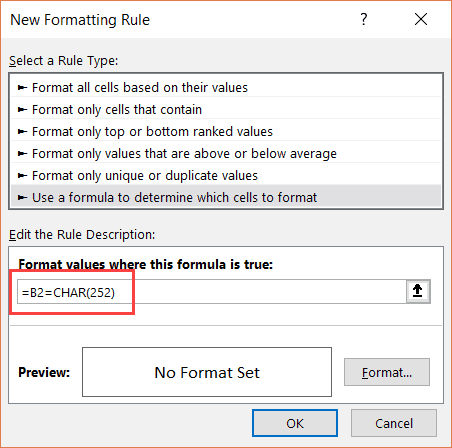 Change the formula to =B2=char(251) in step 6 and formatting in step 9. If you want to count the total number of check marks (or cross marks), you can do that using a combination of COUNTIF and CHAR. 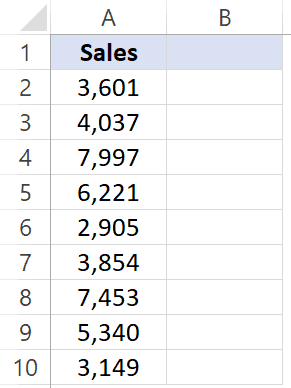 For example, suppose you have the data set as shown below and you want to find out the total number of stores that have achieved the sales target. Note that this formula relies on you using the ANSI code 252 to get the check mark. This would work if you have used the keyboard shortcut ALT 0252, or have used the formula =Char(252) or have copied and pasted the check mark that is the created using these methods. If this is not the case, then the above COUNTIF function is not going to work. 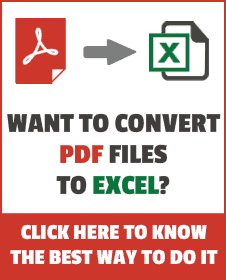 How to Insert Delta Symbol in Excel. 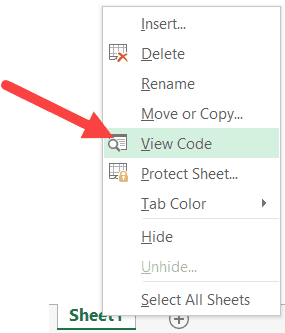 How to Insert Degree Symbol in Excel. 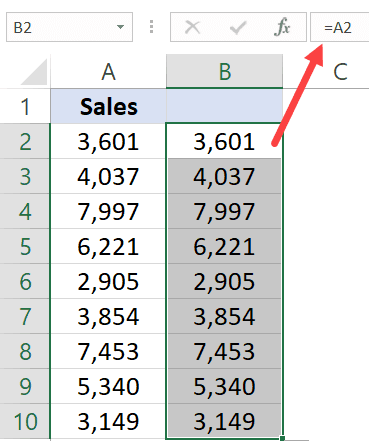 How to Insert a Line Break in Excel.